[Oakland? ], (n. d.). 1st printing (presumed), ca 1940s. Not in Axford, nor Wheaton & Kelly. Spiral bound, with tan faux-leatherette covers, lettered in blue. Age-toning. A bit of prior owner marginalia. Some modest wear, VG to VG+.. 125,  pp. Each recipe credited with the contributor's name. 8vo. 9" x 5-7/8"
"This Book is Dedicated to Our Boys in the Service. 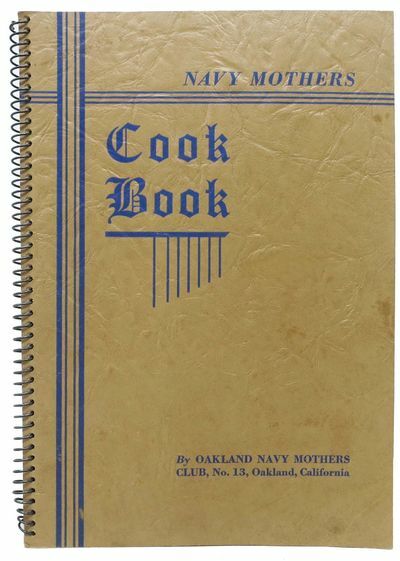 Note: All recipes in this book have been contributed by the Mothers of our Boys."